Hello everyone! I hope y’all are doing well. It’s the same old stuff for me. Looking forward to Halloween though– it’s always my favorite holiday. And I want to go to a haunted house since I haven’t been to one in a long time. Today, I want to talk about updates on the hyperloop concept since Elon Musk has made the proposal. The Technology Futurist of AutoDesk, Jordan Brandt, has also added some significant input as well. He says “Elon Musk put a lot of this energy into designing the pod capsule, and the power requirements, and things like that,…but not so much into the infrastructure, which by the way is the most expensive aspect of the project.” Using 3-D modeling software, Brandt has redesigned the tubes such that they are stacked in a vertical figure 8 design. According to his calculations, this should reduce land area requirements and the quantity of pylons needed to support the tubes. Along with other engineers at AutoDesk, he also devised a system, called a mobile braiding system, which would use carbon nanofibers to create the tubes as it moves along the planned route. With a refinement in the carbon nanofiber manufacturing process the material could be cheaper and the transportation for the construction costs could be greatly reduced as well. In his final estimate, he believes this will save billions of dollars on the project. In my opinion, these are the types of innovations I was hoping would be made on the design. In my previous blog post (http://goo.gl/X1UgIK, second to last paragraph), I cited construction costs as one of the critical issues to address and this is an innovative idea. I worry that the refinements in manufacturing the carbon nanofiber might not be as effective as thought and I also worry about the need to create yet another untested machine to complete the project. However, these are the types of creative ideas that I think are needed in transportation design going forward. What are your thoughts on these new developments? Do they help or hurt the viability and the implementation of the project? Thanks for your time and have a good week! Hello everyone! I hope your week is going well. Nothing new is happening as far as work goes. However, my blog has 25 followers which I’m happy about. If I was more dedicated to it I’m sure I would have more lol, but I appreciate the meager following I do have none the less. 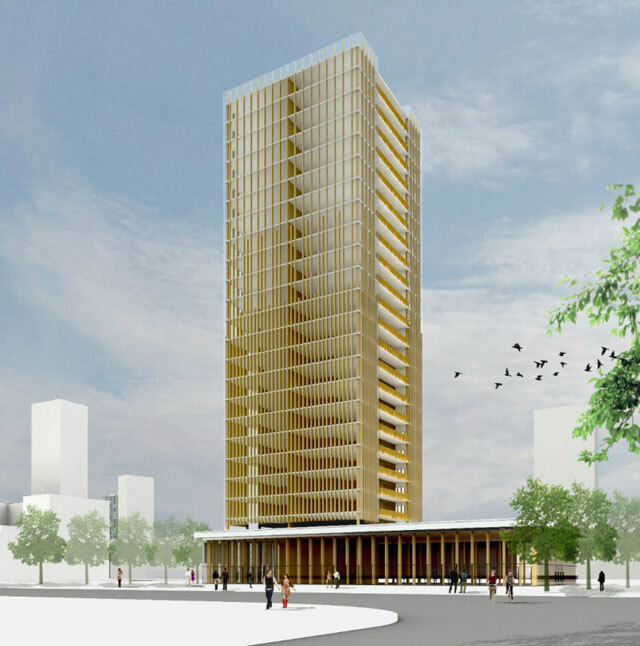 Today I wanted talk about an increasing trend in timber design – the usage of mass timber. I recently read an article talking about a firm and some of their designs they have applied it to in this article – http://goo.gl/kp74gr. I won’t go into detail about the projects listed in the article itself because it isn’t so much about mass timber, but instead about the companies projects. My goal today isn’t to do a description of the companies projects and applications but rather some of the benefits listed in the article. Sustainability – Using timber, as most people know, has the benefit of being sustainable because it is created in nature. This allows it to be the most energy efficient in regards to production and has the lowest pre-construction carbon emissions of all the materials . Along with that, timber will continue to absorb some carbon from the atmosphere even when part of the structure. One of the common concerns about the movement towards mass timber is the exhaustion of the timber resources. However, the way mass timber is created combined with replanting operations for the trees that are chopped down can help with that issue. Allows for Increased Building Height – Currently the IBC has building height limit of about 4 stories. These improvements introduced by mass timber can allow for buildings to be built over this height which then means that a lot of buildings that required concrete or steel in their designs before could now be built with timber if applied correctly. More time and research will be required to allow for change in the code, but the current research and applications seem promising in regards to that. Fire Protection – Mass Timber also has greatly improved fire protection which is a critical element in regards to the IBC as well the building height limit. More specifically, the article notes that mass timber doesn’t burn as easily as regular timber – my guess would be due to the size and treatment in the creation process. Also, larger members such as mass timber and regular large size timber beams form a charring around it which helps add greater fire protection. Increased Directional Strength – Mass Timber that uses the glulam process can increase strength in one direction very efficiently which could help with the lateral loads for wind and earthquake. These loads become increasingly critical as a building increase in height and this should help in dealing with the larger wind and earthquake loads on taller buildings. What are your thoughts on the Mass Timber innovation? Have any of you seen this used in design practice and, if so, what advantages/disadvantages have you seen? Thanks for your time and have a good week!